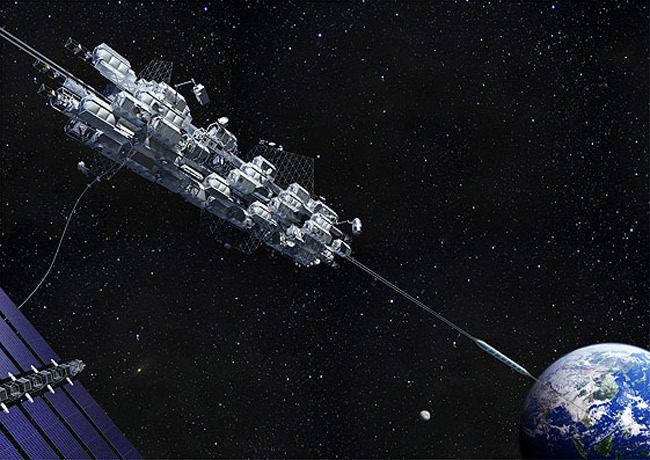 An artist's illustration of a space elevator hub station in space as a transport car rides up the line toward the orbital platform. Solar panels nearby provide power. CREDIT: Obayashi Corp.
TOKYO (TRP) – It’s an idea I’ve had since… like, forever: A high-tech elevator that would shoot passengers into space, delivering them to a station for the best weekend ever. Well now the crazy – yet super cool – concept may actually come to pass as a Tokyo-based company is now reportedly in talks to develop the structure. Japan’s Yomiuri Shimbun newspaper, which first reported the news Wednesday, confirmed that Obayashi Corp. plans to build the ambitious operational space elevator by 2050. The elevator will surely give Springfield’s 50 ft. magnifying glass, popsicle stick skyscraper and elevator to nowhere a run for their money.